Using inexpensive distilled white vinegar in laundry will whiten, brighten, reduce odor, and soften clothes without harsh chemicals. Vinegar is safe to use in both standard and high-efficiency washers and is beneficial to septic tanks and the environment. 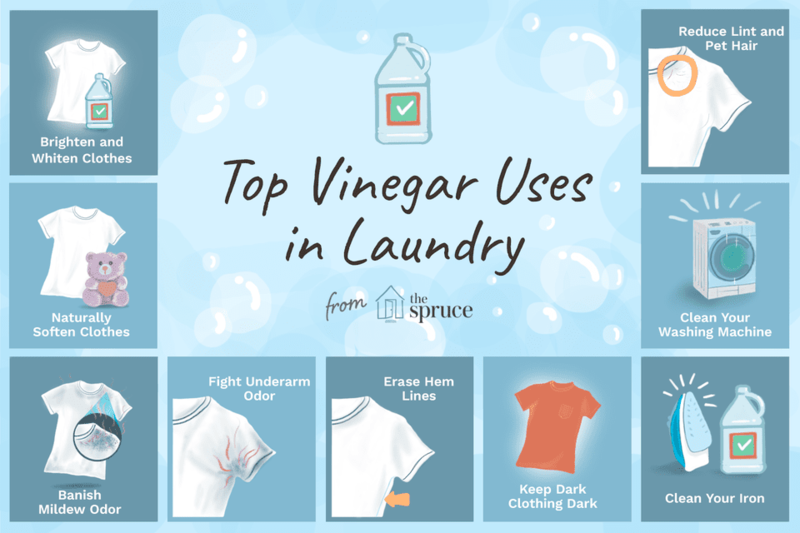 All types of vinegar contain acetic acid that works to brighten, soften, and kill odors in your laundry. Cider vinegar is made from the juice of apples and has an acidity in the range of five-to-six percent. It is yellow or golden amber in color. Distilled, or white vinegar, is produced from the second fermentation of dilute distilled alcohol. The alcohol could be made from grain or the starch from corn, potatoes, rice or barley. Distilled vinegar is usually less acidic than cider vinegar and ranges from four-to-seven percent acidity. It may also be labeled as Cleaning Vinegar but can be used in laundry. When buying vinegar to use in the laundry, choose distilled white vinegar. It contains no tannins (natural plant dyes) that can stain clothes and it is less expensive. If you must use cider vinegar, use less and dilute it with water before pouring directly on clothes. The acetic acid in distilled white vinegar is so mild that it will not harm washable fabrics; yet is strong enough to dissolve residues (alkalies) left by soaps and detergents. Adding just one-half cup of vinegar to the final rinse will result in brighter, clearer colors. Add the distilled white vinegar to the fabric softener dispenser or add the vinegar manually at the beginning of the rinse cycle. The mild acetic acid in vinegar also acts as a whitener and brightener for gray, dingy clothes. To get stained white socks and dingy dishcloths white again, add one cup of white distilled vinegar to a large pot of water. Heat to boiling and add the dingy items. Allow them to soak overnight and then launder as usual. This method should only be used on 100 percent cotton fabric. Leaving wet towels in a hamper or a load of wet clothing in the washer can create mildew growth and a moldy smell. To get everything smelling fresh, fill the washer with hot water, add two cups of distilled white vinegar and run a complete wash cycle. Run a second complete cycle with detergent added. This works well for small amounts of mold and sour smells. For larger mold issues and stains, you'll need to use a more aggressive treatment. If you don't like the idea of using heavily-scented commercial fabric softeners, but want softer clothes, distilled white vinegar acts as a natural fabric softener and leaves no residue on laundry. Just add one-half cup to the final rinse cycle. If you do like a light scent, add a couple of drops of an essential oil like lavender to the bottle of vinegar. Commercial fabric softeners interfere with the fire retardant qualities of children's clothing, especially pajamas, and should never be used for their laundry. Distilled white vinegar is safe and hypoallergenic for all children's clothes. Just one-half cup of white distilled vinegar in the rinse cycle will help prevent lint and pet hair from clinging to clothes. It also helps get rid of the excessive lint if you accidentally washed something dark with some lint-producing towels. Fill a spray bottle with undiluted distilled white vinegar and keep it on hand in the laundry room to remove perspiration odor and stains on washable clothing. Spray the vinegar directly on the fabric on the inside of the underarm areas and allow it to work for at least ten minutes before tossing the garment into the washing machine. If the fabric feels stiff before washing, use a soft-bristled brush to break up the residue. The vinegar will help to cut through residual deodorant left on clothing and prevent underarm yellowing. Kids seem to grow overnight and pant hems have to be let down, often leaving a mark. To get rid of the tiny holes left along a seam or hemline when a garment is altered, moisten a white cloth with distilled white vinegar, place it under the fabric and press. Select the correct ironing temperature and use a pressing cloth on top of the fabric to prevent scorching. Adding one-half cup of distilled white vinegar to the final rinse cycle will remove soap and detergent residue that makes washable black clothes look dull. If your washable clothing reeks of cigarette or cigar smoke odor, add one-half cup distilled white vinegar to the wash cycle. For dry clean only clothes and furnishings like pillows and drapes, fill the bathtub with very hot water and add one cup vinegar. Hang the clothes or fabric above the steaming water and shut the door so the steam can penetrate the fibers. Distilled white vinegar is also effective in removing heavy smoke odors in the air following a kitchen or other small household fire. A clean washer equals cleaner laundry. Soap scum and mineral deposits can build up in the hoses of your washer restricting water flow and performance. Four times per year, remove soap scum and clean the hoses by running a complete wash cycle with the washer empty using hot water and two cups of distilled white vinegar. If you have automatic detergent or fabric softener dispensers, place distilled white vinegar in the dispensers to dissolve any residue build-upthat may limit performance. Use vinegar to clean more frequently to help freshen a front load washer with musty odors. Mineral deposits can clog an iron's steam vents and spray nozzles. To clean an iron and remove those deposits, fill the water chamber with a solution of equal parts distilled white vinegar and distilled water. Set the iron in an upright position on a heatproof surface and let it steam for about five minutes. When the iron is cool, rinse the tank with distilled water. Refill the iron and shake water through the vents onto an old cloth. Finally, iron an old cloth for several minutes to expel any residue before moving on to ironing wearable garments. To remove scorch marks from the faceplate of an iron, rub with a paste of equal parts distilled white vinegar and salt. Finish by wiping down the faceplate with a cloth dampened with full-strength distilled white vinegar. What Are 10 Laundry Tips That Will Make Clothes Last Longer? Are You Getting the Best Laundry Results from Chlorine Bleach? Why Do I Have This White Residue on my Clean Clothes? What Is the Laundry Load Capacity of My Clothes Washer?